A solid understanding of Virtual Private Cloud (VPC) architecture is central to just about everything connected to the Amazon Web Services universe. But if you’re thinking of taking the AWS Solutions Architect Associate level exam, it’s critical. In this post, I will explain why I believe this to be true and specify which VPC elements will require your greatest focus if you’re serious about passing this exam. As you can see, 60% of the exam is specifically focused on Designing highly available, cost-efficient, fault tolerant, scalable systems. In my experience, what that really means is…understand the virtual private cloud. So let’s outline the virtual private cloud elements I think are the most critical. Security groups work at the instance level to control all traffic into and out of associated Amazon EC2 instances. Network access control lists (ACLs) work at the subnet level to control all traffic into and out of associated subnets. As a complete guide to VPC security is way beyond the scope of this post, be sure to read through the excellent Amazon documentation on the subject. A valid course to deep dive into AWS Networking is this Networking Fundamentals for AWS course in the Cloud Academy library. Make sure you understand the difference between public and private IP addresses. Simply put: private IP addresses are not accessible from the Internet but are used for communication between instances within your virtual private cloud. Public IP addresses, on the other hand, are accessible from the Internet and can be used for communication between your instances and the Internet, or with other AWS services that have public endpoints. The Solutions Architect exam may contain some tricky IP-related questions. You might be expected to know how to connect a private IP to the internet or to understand how specific protocols can affect connectivity. You’ll also need to understand how public and private IP Addresses interact with Security Groups and Network ACLs. Again, AWS documentation and the Cloud Academy’s Creating and Configuring Basics for Your EC2 Network course are your two best friends here. You are almost certain to see at least one Network Address Translation (NAT) question on the exam. How, for instance, can you connect an instance from a private subnet to the internet (to allow software updates)? You could create a special NAT instance in a public subnet in your virtual private cloud to provide controlled outbound connectivity to instances in the private subnet while restricting all inbound traffic. If you’ve never set up a virtual private cloud on AWS, I suggest that you do it now. Play around with various VPC configuration profiles to see for yourself how your public and private networks interact between themselves and the outside world. 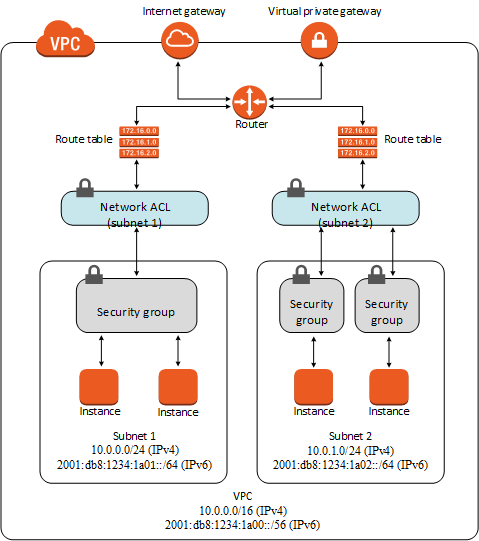 A VPC peering connection is a networking connection between two virtual private clouds that enables you to route traffic between them using private IP addresses. This configuration scenario is important enough that you might face a related question on the exam. Again, the best option is to play around on the AWS console and try and set up 2 or more VPC’s and then play around with routing traffic between them using private IP addresses. I cannot overstate the importance of fully understanding VPCs for passing the AWS Solutions Architect Associate exam. This article obviously doesn’t cover the whole topic. You’ll still need to work on other pieces of the puzzle like Network Interfaces, Route tables, and Internet gateways, and how they all interact with each other. The AWS exam is well designed as a challenging test of your practical skills. As there are very few obvious or easy answers, you should definitely not take passing for granted, and perhaps more than any other topic, you should focus your preparations on VPC.